okay so let's do it, people! 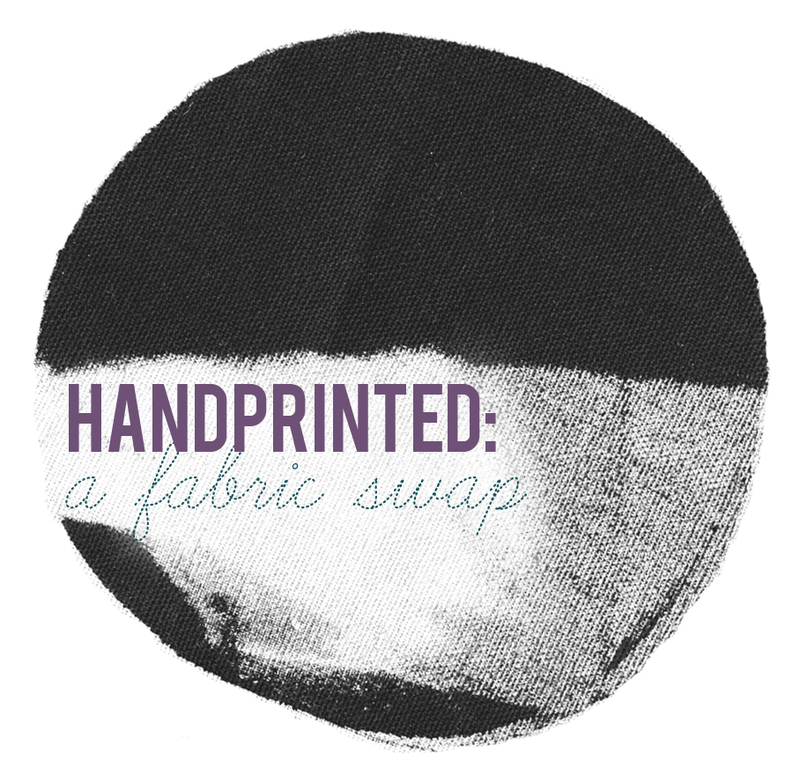 let's explore, print and trade some original, hand printed fabric. you'll be sending one printed fat quarter to each of four assigned swap buddies and receiving four printed fat quarters from these same folk. whether you want to print one whole meter (yard) and chop it into quarters or you want to print four separate 50cm x 50cm (18inch x 20inch) pieces is up to you. designs must be your own and hand printed using whatever technique you want to play with. please print on natural fibers - cotton, linen, hemp or a blend of these - and be sure you use ink/paint designed for fabric. you will be sent your swap mates' preferred colours but, in the end, ink colours and design are entirely of your own choosing. signups will be open until friday, october 21st. your swap group details will be sent to you by sunday, october 23rd and the deadline to send your fabric is monday, november 14th, which gives you plenty of time to play around with techniques but gets everything in the mail before the bulk of the holiday postal crush (if you can send your fabric out sooner, i encourage you to do so). this swap is open to anyone, anywhere in the world, which means if you sign up, you have to be willing to ship fabric overseas (since we'll only be sending fat quarters, you may be able to sandwich your fabric between two pieces of card and send it in a C4 (8.5 x 11inch) envelope to keep postage costs down). there are a ton of books on every kind of fabric printing you can imagine but one i can recommend wholeheartedly is lena corwin's Printing by Hand: A Modern Guide to Printing with Handmade Stamps, Stencils, and Silk Screens. i've also started a handprinted board on pinterest, a great place to start if you're looking for inspiration. if you come across something really cool, please feel free to add links to tutorials or inspiration in the comments on this post. and please feel free to blog about the swap to encourage more people to sign up. i'm super excited to see what everyone comes up with! oh this sounds so fun! gosh, I'd love to try, maybe this should be my excuse to just go for it! I really, really want to do this, but I am moving this month and have my house in shambles. Please so another one! Just signed up! SO stoked!! this sounds fab, i want in!! I'm sending a note too to say how wonderful an idea, but I hate committing if I don't believe I can get on top of it. So I will have to hang out for the next time! Just signed up, looking forward to playing around with some printing! It is a crazy time of year but I am in! Awesome swap idea. Thanks! Hi Leslie, great idea, sounds like fun! I hope it’s not too late to participate, will email you my details in few seconds. Darn missed it by...........this much! I'll keep an eye out for the next one. Oh man! I'm so sad I missed the deadline on this - It's right up my alley! Hopefully there will be a next time! That being said - If anyone unexpectedly drops out of the swap and you need a place filler, please contact me! I'm in school for pattern design and in the studio all the time, so it would be no problem for me to fill in if need be! I hope the swap is wonderful! awesome, thanks, victoria! i will let you know if anyone drops out and yep, i hope to hold another handprinted swap next year. love your work, by the way! hi deb, you could try looking into spoonflower (although they have their own fabrics they supply to print onto but they have a few options that would be suitable for pillow covers). there is an amazing duo here in melbourne calld ink & spindle that will do custom screen printing but the postage on fabric is pretty horrendous. you can find them at http://www.inkandspindle.com.au if you want to make inquiries! good luck! Hey. Love this idea and would love to join in next year. Could you suggest places in Melbourne to buy the natural fabrics you suggested. I live in Thornbury so North-side or city would be good! hi marieke, i would suggest rathdowne remnants (off lygon st), the fabric store (brunswick st), clegs (city or lygon st), tessuti (city) or even spotlight (they don't have hemp but they have some surprisingly nice prima homespun cotton, organic cotton and decent linen). actually, lincraft has a nice selection of linen/cotton blends, too so you don't have to look far, really! I would love to get into this swap. Will you be doing another one soon? hi margaret, i'm really not sure when the next one will be, the rest of this year is already looking pretty busy for me! maybe early next year? Thank you! I've always wanted to learn fabric printing because I love personalizing stuff. I would print on any apparel and make any artistic design I could think of! Hand-printed fabrics huh? Sounds like something my wife will definitely sign up for. She's the enterprising homeowner type, and she's definitely looking for something to change up how our house's furnishings look.